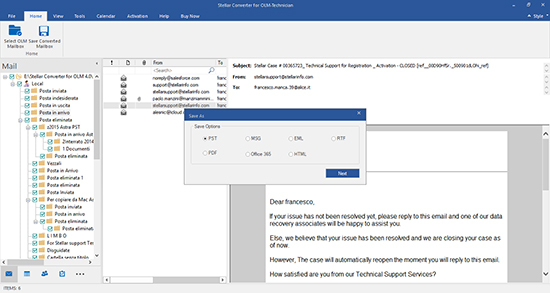 Converting OLM file to the Outlook PST files is a huge need for many individuals as well as professionals worldwide. 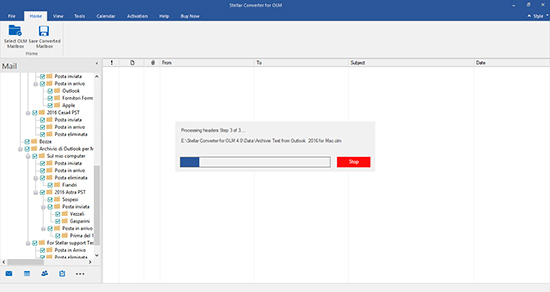 Stellar Converter for OLM is a perfect choice for all of them, who wish to switch over to Outlook for Mac to Microsoft Outlook. Here are some of the key features of the product. The software is ideal transferring the data of the Outlook for Mac (OLM) file to Microsoft Outlook PST profiles. It smoothly converts the respective mail folders, such as Inbox, Calendars, Contacts, Notes, Tasks, etc. to the respective folders in the MS Outlook. While doing the conversion, the tool keeps the mail settings, configuration, and content unaffected. There is another smart feature included in the software that enables you to preview the mail items, such as the individual mails, contacts, notes, tasks etc, after you convert OLM to PST. The software lists all the converted mails according to their structure hierarchy and as you click the particular items, the preview pane shoes them in them. This option is very useful to check the conversion before saving and if you trying the demo version. Stellar Converter for OLM tool has a very useful option to select or find an OLM mailbox out of several mailboxes. The 'Select Mailbox' option is useful in selecting a particular OLM file from a known location in the system. However, if you do not know the location of the OLM file, then the 'Find Mailbox' option comes out as a very useful help. This option lists down all the OLM files present in a particular volume and then you can select the one to be converted. 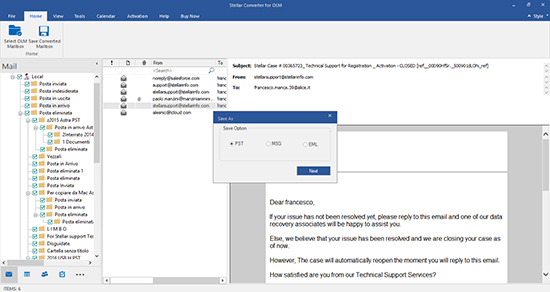 In addition to saving the converted OLM file as Outlook PST, the software also enables saving them as MSG (messages) and EML (emails). In the saving window, there are options to save as Office 365, PST, MSG, EML, HTML, RTF and PDF. 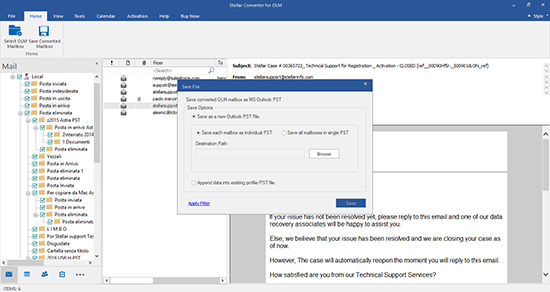 Further, you can save as a new PST file or append the newly created PST to an existing Outlook profile. To keep the software up to date, there are minor and major update available times to time. The 'Live Update' wizard integrated to the software. The tool automatically detects any such update available online and installs that for keeping the software up to date. 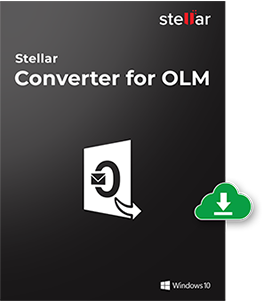 Stellar Converter for OLM tool assist the user to use their email files on Office 365 mailbox. User can save converted PST into Office 365 format which is basic input for Office 365 mailbox. 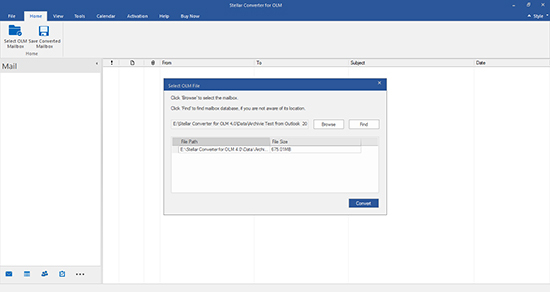 To get an idea about the detailed activities carried out during the OLM to PST conversion, the software generates a log report of the same. You can save the log report as well. Though Outlook for Mac 2011 has remarkable features as an email client, it lacks in many aspects and truly cannot emerge as a winner its category as other Microsoft products, such as Outlook. 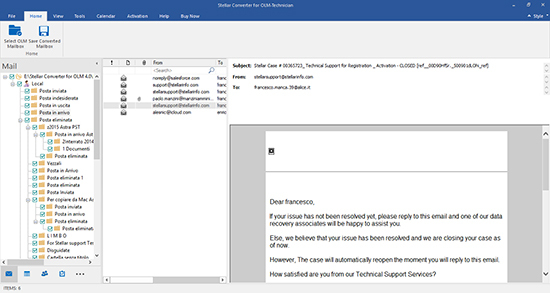 In addition, Outlook for Mac cannot handle attachments in RTF (Rich Text Format) formats mail messages from other mail clients, such as Outlook for Windows that use 'winmail.dat' attachment. Factors like these make OLM a relatively second choice over MS Outlook. Also, if you have been moving on to some other company or business, where there is MS Outlook is mandatory; however, you do not have the back up of your mails as PST; you need to convert them as PST. In similar situation, Stellar Converter for OLM comes to be of great help for you. 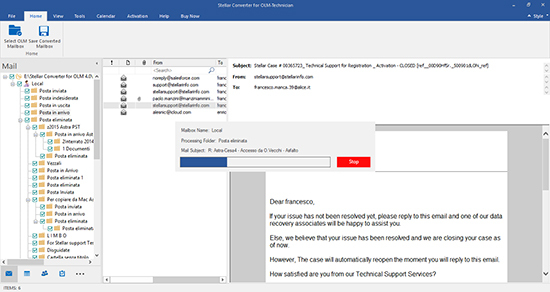 Step 1: The home screen of the software provides option to select Mailbox (OLM). If you have no idea about location of OLM file, then click on 'Find Mailbox'. Step 1: This is the main interface of software. It provide option to select Mailbox. (OLM), If you have no idea about location of OLM file, then click on 'Find Mailbox'. Step 4: In this step, you can save the PST in desired formats. 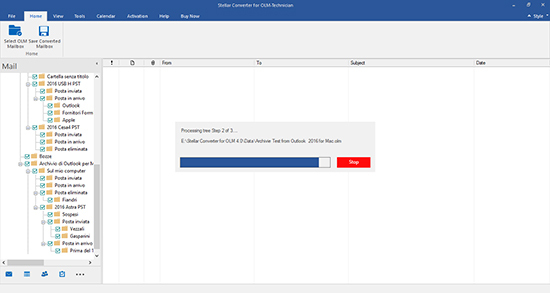 Due to migration from Mac workstation, I was worried about Outlook Mac data (OLM) file. I also had no idea about data transfer towards Windows based MS Outlook application. I tired numerous tools but my search ended with Stellar Converter for OLM. It exported entire OLM file into PST file format. Really! It is an innovative program for successful email migration from Mac to Windows platform. Que: What is the survival time of my licensed version?